BOGNOR’s striker search continues ahead of tomorrow’s match at home to Wealdstone. Boss Jack Pearce says they could push for the National League South play-offs if they could find a new forward. The club say they have made serious enquiries about 10 different forwards – all to no avail. It comes as the Rocks reflect on a battling performance against Leyton Orient in the FA Trophy in which they pushed the visitors all the way with the help of a Jimmy Muitt wonder-strike before an extra-time 2-1 defeat. 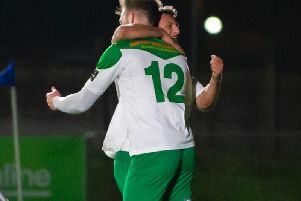 Players, management and fans have all taken great heart from the performance but know they now have to turn it into goals and victories in the league – starting at home to Wealdstone. The Rocks have 17 games to save themselves but are six points from safety. Pearce said it was another fine performance from the team against Orient but admitted these were no good if they kept ending in defeat. He said: ‘I’ve taken a lot from the past five or so home games. Unfortunately we’ve lost or drawn them when we should have done better. ‘I’ve never known a group of players work as hard as they do and get beaten. I know what teams are like who get beaten on a regular basis and it’s normally when there’s not a good atmosphere in the dressing room or there’s a few prima donnas – but I haven’t got any of that. ‘The players are grafting and there’s a superb atmosphere but when you keep losing it’s depressing. ‘But we’ve just got to go again. ‘We’ve got 17 games left in the league and we’ll have to work just as hard. French midfielder Richard Gilot, 21, had an impressive debut against Orient cut short by a red card. He and forward Ben Swallow are both banned for the Wealdstone game tomorrow. Midfielder Tommy Block has been on trial with Sunderland this week but should be available for Bognor on Saturday. Joe Lea has joined Gosport Borough.